This week we again travel down Lowell Road with a right turn onto Atwood Avenue and a stop at number 7, the site of Tiny’s Garage. We remember the man called ‘Tiny’, his business, and the family who worked with him. Chester ‘Tiny’ Sojka grew up in Derby, CN and joined the Civilian Conservation Corps as a young man. After Pearl Harbor he enlisted in the Army and served as a tank mechanic; being stationed in North Africa and Italy. He met his wife Mary while on leave and they were married in December 1944. 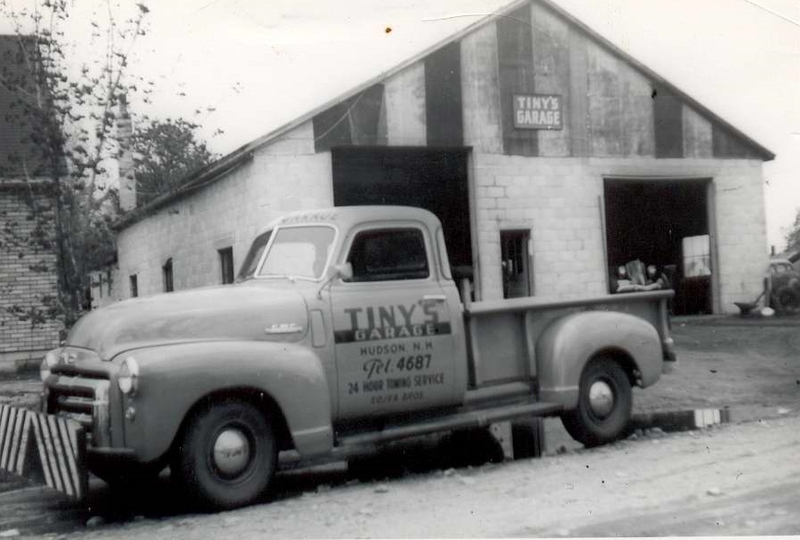 After his discharge in 1945 he started a garage repairing and towing cars. They settled in Nashua and later moved to Hudson and opened his business here. Over time the business evolved to include salvaging and selling used car parts, especially those which were hard to find. His business included the entire cycle: towing wrecked cars, recycling automotive liquids (gas, oil, antifreeze), breaking down the wrecked vehicle for usable parts, maintaining an inventory of these parts, and selling them to other mechanics and ‘do it yourselfers’ as they repaired vehicles of the same or comparable model. I’m sure many mechanics or DIYers remember going to or calling ‘Tiny’ to see if he had the needed part in stock. I myself recall an ad for Tiny’s that said: Please Drive Safely – We Don’t Need your Business. ‘Tiny’ and his brother John were noted for their inventory control prior to the computer age. Much of the inventory was well cataloged in their minds augmented by books that cross referenced replaceable parts. All customers, professional or not received the same service and same price. This became a highly competitive business. A 2-way street with insurance companies was established: biding for the wreckage in all parts of New England, salvaging usable parts and placing then in stock, then selling to insurance companies or their mechanics to get damaged autos back on the road. This was a family business. He was helped by brother John; his wife Mary acted as the bookkeeper, and son Eric grew up with the business and took over from ‘Tiny’. He had a passion for miniature Dachshunds. He rode his motorized scooter with pet Dachshund Holly on board in the early 2000’s. ‘Tiny’ passed in 2004 at the age of 87 leaving behind memories which defy his nickname. Information on Chester ‘Tiny’ Sojka and his business was previously published in The Hudson News November 12, 1969 and in the Nashua Telegraph at the time of his passing in November 2005. The photo is from the collection of the Hudson Historical Society. By Ruth M Parker in Lowell Road on December 9, 2016 .